Jackie Tyrrell says discipline was never an issue in the Kilkenny camp during his career. 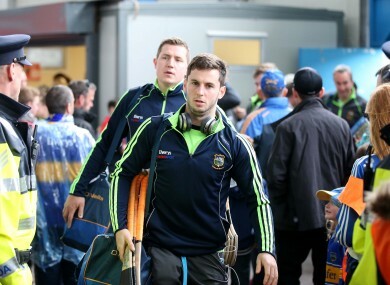 IT’S BEEN A difficult few weeks for Tipperary supporters. On 23 April, Galway ambushed the Premier in the league final and the manner of the 16-point defeat raised doubts about their ability to lift back-to-back All-Irelands for the first time since 1965. Those doubts were compounded by a dramatic championship defeat last Sunday week to a Cork side featuring five full debutants. Last night, the news broke that Cathal Barrett had been dropped from Michael Ryan’s panel for disciplinary reasons. “What’s going on now though could be the sort of thing that cripples them for the year,” wrote ex-Kilkenny forward Richie Power in his RTE.ie column today. Power’s former team-mate Jackie Tyrrell doesn’t necessarily agree and has backed the reigning All-Ireland champions to make it back to September. “One bad defeat, that same Tipperary team in 2010 had a bad defeat and the wheels seemed to be coming off the wagon then and they turned it around,” Tyrrell says. “I would have unbelievable time for Michael Ryan. I think he’s a very, very good manager. During his own time in the Kilkenny squad, Tyrrell doesn’t recall team discipline ever being an issue under the rule of Brian Cody. “Any of that messing wasn’t for the Kilkenny set-up,” he says. “It just didn’t exist. You wouldn’t be able to. Obviously Brian would have never really had to deal with those things. The players would have expected ultimate professionalism. “We got it and we were lucky to get it. That was just our set-up but Brian would have created that environment and created leaders to carry that mantle. Email “'Any of that messing wasn’t for the Kilkenny set-up. It just didn’t exist'”. Feedback on “'Any of that messing wasn’t for the Kilkenny set-up. It just didn’t exist'”.